The Carefree Way: Tempting fate with another day off from adventure! Tempting fate with another day off from adventure! Okay, so one more reminder...I'm raising money to help young folks with cancer through Team First Descents. There's just over a week to go and I haven't reached my goal. Please donate! 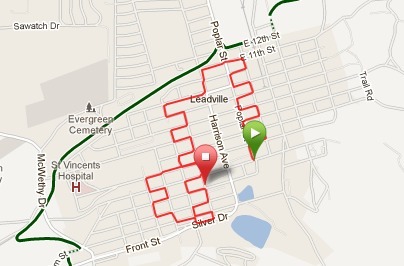 That was kind of a cool map to make, though with Leadville being on a hill, this was like a crazy interval run. Then I got a shower which thankfully took care of the rest of the dye on my hands. Otherwise? It's been a boring day. Matt and I had some lunch at a very good local Mexican place and have just done some housecleaning around the RV and watched Olympic coverage. Weather has been pretty rainy all afternoon, so not much else to be done. So now that you're sufficiently bored, click this link and donate! Many thanks.